Earthdayogathon supporters - For a Cleaner Earth, Cleaner You! The Protect Our Breasts Earthdayogathon is our annual opportunity to help prevent breast cancer by encouraging a cleaner earth, cleaner you. 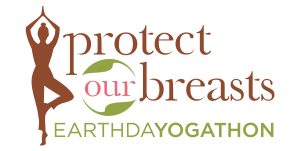 Attend, host, or sponsor a donation-based yoga class around Earth Day, April 22nd, to support the sharing of digestible science-based tips to embody a cleaner, healthier lifestyle. Sponsors and studios donate here! Thank you for your support! How will your participation help Protect Our Breasts? We engage ambassadors at our 35+ college and high school chapters; prompting them to share peer-to-peer about their daily choices gleaned from our national social media feed while also recommending safer alternatives. These individuals need your support for communications materials of our translated science. Encouragement Patrons - Encourage us to reach more young women to save more lives! One in eight women will develop breast cancer in their lifetime. Currently, there are more than 3.1 million breast cancer survivors in the United States (American Cancer Society 2017). Protect Our Breasts is dedicated to saving lives by sharing the conversation about chemicals in everyday products that contribute to breast cancer; encouraging young women to make safer choices up through their first full-term pregnancy - a significant window of susceptibility. Through science based, peer to peer education, we translate endless scientific journals, books, and articles into a stream of digestible tips for a safer, healthier lifestyle. We bring awareness to college, university and high school campuses and encourage students to think critically about the long-term impacts of the daily choices they make. We only promote products that have been reviewed by our science and standards advisory board and have undergone our vetting process. This encourages industry to create safer products in the future.